Structured to meet employers’ needs for low-wage farm workers, the well-known Bracero Program recruited thousands of Mexicans to perform physical labor in the United States between 1942 and 1964 in exchange for remittances sent back to Mexico. As partners and family members were dispersed across national borders, interpersonal relationships were transformed. The prolonged absences of Mexican workers, mostly men, forced women and children at home to inhabit new roles, create new identities, and cope with long-distance communication from fathers, brothers, and sons. 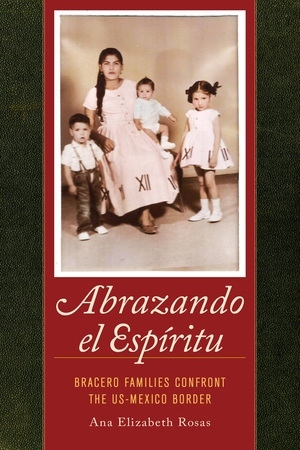 Drawing on an extraordinary range of sources, Ana Elizabeth Rosas uncovers a previously hidden history of transnational family life. Intimate and personal experiences are revealed to show how Mexican immigrants and their families were not passive victims but instead found ways to embrace the spirit (abrazando el espíritu) of making and implementing difficult decisions concerning their family situations—creating new forms of affection, gender roles, and economic survival strategies with long-term consequences. Ana Elizabeth Rosas is Associate Professor and Director of Undergraduate Studies in the departments of History and Chicano-Latino Studies at the University of California, Irvine.